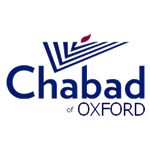 To read about Prof. Dershowitz's visit to Oxford Chabad Society click here. The event was organised by the Oxford Chabad Society in-conjunction with ECJS. 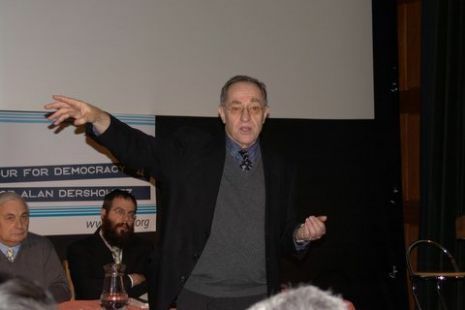 Professor Dershowitz’s talk focused on the unreasonable attempts by Israel’s opponents to delegitimise Israel’s right to exist as a state, raising awareness that Israel is “constantly demonised by the press” and subject to double standards by academics. While criticism is vital to democracy and good governance, Professor Dershowitz argued, it must be comparative, consistent, and not hold Israel to higher standards than anywhere else in the world. Professor Dershowitz emphasised what constitutes the difference between being Pro- Palestinian and Anti Israel, stating that many people in the latter category “shed crocodile tears for the Palestinians” while their principal focus is the delegitimisation of Israel. Professor Dershowitz also spoke at a buffet lunch held at the new Rohr Jewish Student Centre of Oxford for its inauguration prior to his talk at Magdalen College. The lunch was attended by close to a hundred student leaders and members of the Oxford Jewish community, focusing on the need to combat the virulent anti-Israel tone on campus. Professor Dershowitz is currently on a European tour, speaking in London, Amsterdam and The Hague. Criticism of Israel does not constitute anti-Semitism because otherwise the majority of Israeli society would be considered anti-Semites. Ken Livingston who called a Jewish reporter a Nazi concentration camp guard is a bigot and racist. Whoever criticizes Israel’s human rights record and not the human rights of Arab countries are racists. Not against Israel but against the Arabs. Because they do not believe that Arabs need to be held up to the same standard of human rights as Israelis. The biased against Israel in human rights organisation are such that when listing the problem of honour killings in the West Bank, it pins blame first on Israel and only third the Palestinian culture. People do not care about the Palestinians. It is all about criticism of Israel. When Gaza was brutally occupied by Egypt and the West Bank by Jordan, nobody cared. The Jordanians killed more civilian Palestinians when occupying the West bank than Israel has killed in its entire history. When millions of dollars were being sent to Mrs. Arafat instead of providing care for the Palestinian people no body cared because the world doesn’t care about the Palestinians. It is all about Israel. The Kurds and Tibetans have suffered far more than the Palestinians and have much less rights and who cares about the Kurds or the Tibetans? Prof. Dershowitz was critical of the Israeli government for not allowing their IDF Generals to enter the UK for fear of threat of arrest. Prof. Dershowitz offered to put together a team of lawyers led by him, who will defend every Israeli general. They have nothing to be scared about. He has offered to accompany them when entering the UK. When asked by a student, what does it mean when a fellow Oxford student told him that he has Zionist eyes, he responded by taking off his glasses and declaring that he has Zionist eyes. George Bush, Tony Blair and every reasonable person who believes in the right of the Jewish people to a homeland in Israel have Zionist eyes. Prof. Dershowitz said that the worst ambassadors for Israel are the Israeli embassies and spokespeople, because they have to support every single Israel policy at any point in time. He urged all Jewish students to be proud Shlichim (emissaries) of Israel and support Israel publicly. Prof. Dershowitz said that the inspiration to write his book A Case for Israel came from a Jewish student at Harvard who said that the reason why he doesn’t speak up for Israel when there is discussion at university is because he thinks that if he would no girl would date him. To a question by a Professor why it is Israeli professors who are the most anti-Israel, Prof. Dershowitz responded that the person who can answer that question is Freud. Prof. Dershowitz defended the use of targeted aerial killings in civilian areas. He said that with modern precision weapons it is possible to send a missile into an apartment window when necessary to stop a person who is planning to attack civilians. Prof. Dershowitz said that Israel would never attack civilians intentionally, as it is immoral and does not serve to its benefit. No other country has its Supreme Court telling it what to do in the heat of a battle and listens to it, like Israel did in Jenin, though it did not have to, and had its soldiers killed as a result. Prof. Dershowitz challenged the auditorium to view Israel’s actions in the context of comparing it to other countries that is faced with comparable threats, externally and internally.